Every parent can tell you that getting children to do chores goes one of two ways: their initial excitement at helping, to realizing routine chores aren’t fun. Once they realize they hate doing chores, you find yourself in a position of having to nag your child incessantly. Yet we keep assigning the children chores, and reminding them constantly to do them. Why do we set ourselves up like this? I know it doesn’t seem like it when you’re practically begging a child to do the dishes, but you’re actually teaching them a lifelong skill. RESPONSIBILITY. Every person on the planet has a certain amount of responsibility to deal with in life. The sooner your child learns their own, the better. It takes a lot of work to keep a household functioning. These day to day tasks become overwhelming when it is all on one person’s plate. Divide those tasks up between the members of the house, and it becomes much more manageable. You’re not an island unto yourself, you’re a team. Letting your children take some responsibility for the management of their household lets them know they are a part of the team. Being a part of the team lets them know they are a valued member of the household, not just someone who has to do what they are told. Even though the tasks may be small, you are setting your children up for success when you expect them to do their chores. Happy nagging! 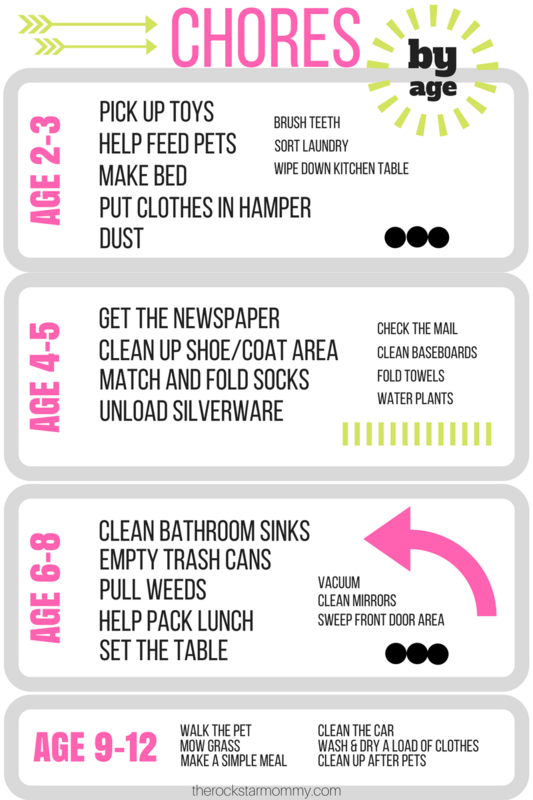 CLICK HERE for your printable Age Appropriate Chores for Kids!